Landscapes in Kenya. Photo credits: Center For International Forestry Research and Tim Cronin. 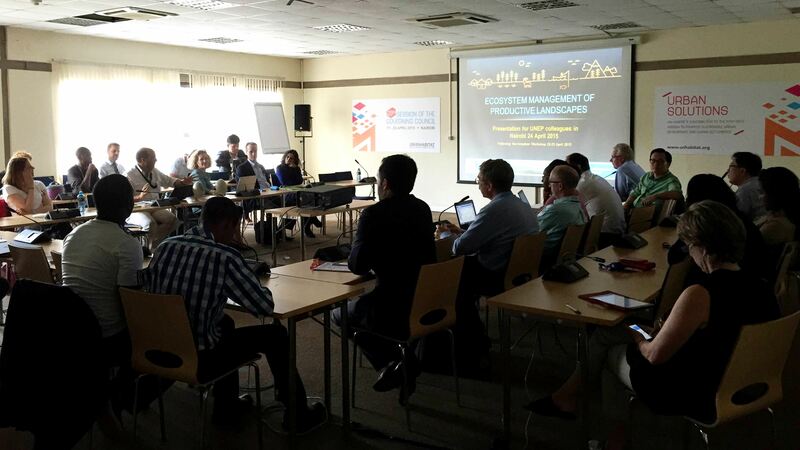 This past April, a team of ecosystem management practitioners came together in Nairobi, Kenya. Their mission? To put the Ecosystem Management of Productive Landscapes project on the map. Demand for food, energy, and fiber is projected to increase 40-60%, a strain on industry and agriculture that will also be exacerbated by stresses from climate change. Considering the future of production in these sectors, it is important to overcome sectoral barriers that inhibit the management of ecosystem functionality. The Ecosystem Management of Productive Landscapes (EMPL) project seeks to address these challenges by encouraging global collaboration on landscape-scale initiatives that promote sustainable production. In the most recent meeting, practitioners hailed from all corners of the United Nations Environment Programme (UNEP) network to provide support to countries that are working on establishing healthy ecosystems. Representatives from various sectors of UNEP came together in Nairobi to discuss the formation and direction of landscape approaches. Photo provided by Nauman Haque. This project can lead the way in creating a new road map for integration of efforts both within UNEP and at the national level in member countries. Other complementary benefits of EMPL includes better sharing of information and a deeper emphasis on the need for new and broader “cross-sectoral” partnerships that allow for landscape-scale projects to take footing. The Ecosystem Management of Productive Landscapes project seeks to develop and promote the Landscape Approach to increase the sustainability of production and improve water, energy, and food security. The plan is to use ecosystem management to complete these goals, a process that will translate into: the enhancement of the knowledge base underpinning landscape approaches, the development of methodologies and tools, and the provision technical support for inter-sectoral policy frameworks. The EMPL project will build capacity among decision-makers and other stakeholders to understand trade-offs, identify synergies and choices to be made in designing more sustainable food production and water-energy management systems, and strengthen the ecological basis of production. The team delved into a plan for the EMPL project, discussing existing resources within the network, suggestions for useful tools, and the project’s potential in the upcoming months. Photo provided by Nauman Haque. The meeting was characterized by UNEP representatives from eight distinct technical units and collaborating centers from three divisions and four regional offices. This team took initial steps to set-up the internal project reporting and “Knowledge Management” structure to explore ways of integrating knowledge developed from GEF portfolio projects. As a result, a knowledge database of landscape approaches in several GEF projects is now under development, a tool which will significantly help build capacity and understanding of Landscape-level approaches at the UN. Furthermore, this effort emphasized the ecosystem dimension of the Water-Energy-Food Nexus and encouraged sustainable production through landscape approaches in Africa, Asia Pacific, and Latin America. The workshop provided an ideal opportunity for the team to share their experiences, knowledge products, tools, and best practices that are being developed in many parts of the UNEP house, each focusing on various elements of the landscape approach covered by the EMPL project. This Ecosystem Management of Productive Landscapes can lead the way in creating a new road map for integration of efforts both within UNEP and at the national level in UNEP member countries. 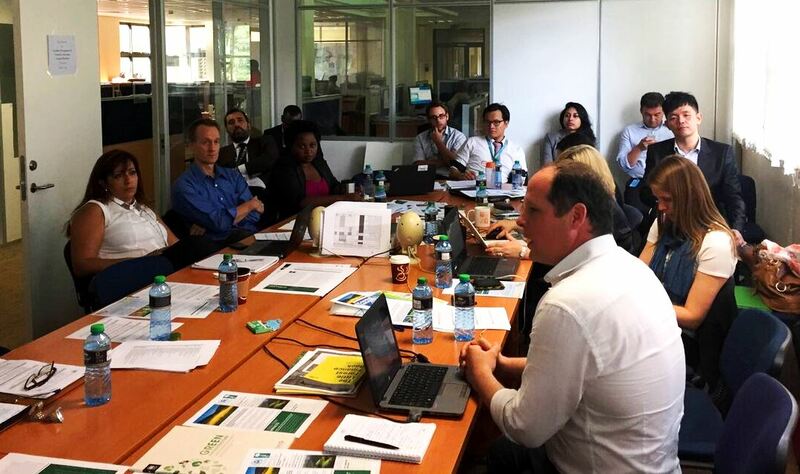 The team came up with ideas on possible themes, emerging tools, and new streams of work that UNEP could showcase at the upcoming Global Landscape Forum (GLF), set to take place in Paris on December 6-7th, 2015. GLF is a recurring event organized by CIFOR that unites interested parties from all around the world to encourage the uptake of the Landscape Approach through collaborative discussions and presentations of recent research. Discussion of some long-term goals for the EMPL project was also a highlight of the meeting. One such debate was on the possibility of helping member countries craft and support a UNEA decision in 2016. The prospective exercise would help members to better understand and implement the landscape approach. Agreement was reached on using the Landscape Approach term explicitly in a decision application, emphasizing linkages with the Aichi targets and supporting the integration of SDGs, as well as how the project should take stock of these critical entry points. We hope this revolutionary project will help mainstream landscape-level development interventions. These steps would build up to integrating sound management of ecosystems with sustainable production of food, fiber, and other outputs while ensuring socio-economic development aspects are addressed. Nauman Haque is a Professional Officer for the Terrestrial Ecosystems Management division of the United Nations Environment Programme. Nauman serves as the primary contact for communications on the Ecosystems Management for Productive Landscapes project. For more information about the project: [email protected]. Re-posted from Landscapes for People, Food and Nature.